Firstly let me start with an apology if you’re on the newsletter mailing list. Last Sunday, as ever in a bit of a rush, I drafted the introductory email and scheduled it as usual to go out at 1pm. One o’clock came and went but I didn’t receive a conformation that the email batch had been sent out. The reason I didn’t receive conformation was because it hadn’t been processed, and the reason for that was because I had scheduled the wrong time. The company which owns the software I use is in the USA. The default time zone they use for scheduling is EST which is five hours behind British Summer Time. I had forgotten to convert the scheduled time to 1pm in the UK so the newsletter was still waiting to be sent out later in the afternoon. I couldn’t alter the scheduled time so I quickly wrote another newsletter introduction then sent it on its digital way. Unfortunately I forgot to cancel the original incorrectly timed emails. Sorry! I hope that if you read the newsletter twice, you enjoyed it just as much the second time. After I finished messing about with the newsletter last week, Sally and I spent half an hour discussing and agreeing the route for our two week cruise at the beginning of June. It was wonderful to finally decide on where we are going, and wonderful to be actually talking again after a couple of days of childish silence from the pair of us after my comment about her obsessive cleaning. The result of our row is that now Sally isn’t doing as much vacuuming in case she sets me off again and, because I feel very guilty about complaining about her cleaning in the first place, I’m now doing almost as much as she was doing to try and make up for making unnecessarily argumentative comments. The wonders of cohabitational bliss will never cease! We had originally planned to go down the south Oxford onto the Thames. It’s a lovely route which I have done before but I wanted to explore the waterways between here and Market Harborough. Our journey isn’t going to break any records for the most miles travelled in fourteen days, but we aren’t intending to rush. The return trip is just seventy eight miles or 5.5 miles each day. We will pass through fifty two locks (34 narrow and 18 broad) and5.4 miles of tunnel (I must make sure that the headlight is in good working order). The total cruising time there and back is an estimated thirty nine hours. All of this information is courtesy of CanalPlanAC. It’s the second most popular inland waterways site in the UK and is an invaluable resource for route planning. It almost instantly provides interesting and useful information about the route’s distance, number and type of locks, bridges, aqueducts and tunnels. The site also allows you to take virtual cruises along your intended route via the photographs submitted by site users. It’s a fascinating and really useful site, but you can’t use it to plan every part of the journey for you. Using the default route calculation settings, the site suggested mooring locations for overnight stops. We like to stop somewhere away from the hustle and bustle of modern day life where I can listen to the natural sounds around me while I enjoy a beer or a glass of wine, or both, after a hard day at the tiller. CanalPlan had a different kind of evening in store for me. On the first evening, after 6 hours 46 minutes cruising, the planner suggested that I stop close to bridge 6 on the Leicester section of the Grand Union. It’s possibly the worst place to stop on the canal network if you want to moor away from traffic noise. Bridge 6 is within spitting distance of Watford Gap Services on the M1 on one side and the A5 and the West Coast Main Line on the other. I suppose if I had run out of food on the boat and I wanted a reminder of the noise and stress of modern day living, I could walk 50m along the B5385 which crosses the canal at bridge 6 to the motorway service station’s staff entrance, which runs alongside the canal, and join the throng of harried travellers stuffing themselves with overpriced fast food. Alternatively, I could use the excellent Pearson’s Canal Companion: East Midlands to identify far more tranquil surroundings to spend the night far, far away from the sight or sound of speeding trains, cars and lorries. Fortunately there are many peaceful spots on this mainly rural route. I intend to stop at as many as I can. Hopefully we’ll have somewhere comfortable to sit by the time we cast off from the shores of lake Calcutt in four week’s time. A month ago I had the boat’s eight upholstered seats and backs taken away to be recovered. Last week I discovered that the work, far from being complete, hadn’t even been started. I was hoping for some better news to give Sally when she comes home from work tonight after twelve hours on her feet. Karl left us with some temporary seats when he took ours away. Unfortunately they’ve come off a slightly larger boat, maybe an ocean liner or an aircraft carrier. They’re so much bigger than the wooden seat bases that we had to climb over them to get from one end of the boat to the other. They drove Sally to distraction so, before she threw them in the marina, I removed them from the boat and stored them in our container where they will be safe. We’ve had a couple of weeks now of sitting on bare wooden seats. The arrangement gives us more space, but it’s not very comfortable. We’re not going to be terribly comfortable next week either. I’m praying for warm weather. Some time next week, I don’t know when yet, our new Webasto central heating system is going to be fitted. The logistics are frightening. Even on the most organised narrowboat there’s very little space so the three or four days the fitters are scheduled to work on the boat are going to be quite uncomfortable. For a start, the stove needs to be cold so that the back boiler can be disconnected and made safe. The stove is currently the only heat source so we’ll either have to endure a cold boat or find some electric heaters to use while the work is done. There’s going to be disruption all over the boat. The fuel tank will need to be drained of 350 litres of diesel so that the new feed for the central heating can be fitted, the fuel replaced then the burner and pipe work added in the engine room. The three existing radiators and pipes on the starboard side will be removed, two new radiators and towel rails fitted on the same side and then a radiator fitted under my desk on the port side. The gas water heater will be removed, the gas feeds capped off, the old calorifier removed from under the bed and a new one fitted in its place. We can’t live in the shed where the work is being done so each morning the boat will have to taken across the marina to the workshops then tidied up each evening before returning the boat to the mooring. I don’t know what Sally or the dogs are going to make of it all. I’m tempted to sleep in the shed where we keep the grass cutting equipment for a few nights. I’m sure it will all go smoothly though and we’ll have a working central heating system for our cruise in June when I’m sure we can expect nights cold enough to test it out. On Friday afternoon, to give myself a break from sitting motionless in front of my laptop writing the newsletter, I took the dogs for a walk. As I climbed back on to the boat I noticed streaks of tar running down the side of the boat from the chimney. I decided to spend just a few more minutes away from the computer to remove the marks. Inevitably, after ten industrious minutes with a mircrofibre cloth and a measure of traffic film remover in a bucket of warm water, the streaks and the accumulated winter dirt were gone, but the rest of the boat was looking decidedly tatty. I cleaned the starboard side next to the pier and as much as the roof as I could reach from the pier, turned the boat around – always fun in a stiff breeze – cleaned the port side and the remaining sections of the roof, then cleaned the brass mushroom vents too. Much as I enjoy cleaning the boat, the task eats up free time I rarely have and highlights every chip, scrape and scuff in the paintwork. I painted the boat myself two years ago. I thought I did a pretty good job at the time but now I’m less pleased with the quality of the work. The boat still looks good from a distance but I won’t be happy now until I book it into one of our paint tents for a day or two to touch it up. Paul and Pei work in London and live on their boat on the nearby river Lee. Decent London residential moorings are as rare as hens’ teeth but this newly married couple have found one. In fact, they like the mooring so much that they rarely move their boat off it. They are very happy with life on board. Initially their move afloat was all about money and the cost of property in and around London. After four years afloat though they now love living almost everything about living on the water. I say “almost” because they can’t stand bugs on board. When they first moved on to their boat they looked at available solutions for keeping crawling and flying critters outside the boat but couldn’t find anything which worked for them, so they designed a solution themselves. The end result is a product which they now sell to other boaters. To find out more about their insect deterrent and to discover more about their life afloat, you can read their case study here. I often receive emails asking for advice about finding residential moorings. The number of enquiries I get are on the increase. In the last week alone seven aspiring live aboard narrowboat and wide beam owners have asked be for advice. If you are tied to a geographical location for work, school or health reasons, finding somewhere where you can officially moor your floating home is often more difficult than finding the boat itself. It’s a challenge to find a suitable residential mooring for a narrowboat, and very difficult to find one for a wide beam. The difficulty in finding a wide beam live aboard mooring for a specific boat was highlighted in my newsletter on 20th April. The boat owners are still here at Calcutt wondering what they are going to do with their boat when their six week temporary mooring booking ends in two weeks’ time. They are so desperate now that they are considering selling the boat that they have lived on for less than two months. In their particular case they did everything right. They searched for and secured a suitable mooring before they had their boat built. Sadly they were let down at the last moment and because residential moorings are generally difficult to find, they are really struggling to find anything at all for their 72′ long 13’6″ wide boat. Finding somewhere to moor a live aboard boat is far more difficult than it used to be. When British Waterways were in charge of the canal network, the enforcement of mooring rules was rather halfhearted. Communities of non compliant continuous cruisers grew along many popular sections of the canal and river network, sometimes staying long term on visitor moorings causing inconvenience to cruising boat owners and often clogging up already busy waterways. Continuous cruisers who moored for long periods in the same canal-side location were largely ignored, encouraging new boat owners who wanted to live on the network to do the same. British Waterways created a new division, the New Marina Unit, to help landowners develop marinas on land close to the canal network. The suggestion was that as the number of available marina moorings increased, British Waterways were going to reduce the number of online moorings and encourage boat owners to moor in marinas. Unfortunately the reality is that many of the canal-side long term moorers are not on official moorings anyway so are not paying mooring fees. Many are reluctant to move onto official berths were they would be charged upwards of £2,000 a year depending on location and facilities available. Even if boat owners without a mooring are prepared to move into a marina, there are very few marinas offering berths for live aboards. Residential boaters are often considered aesthetically displeasing to owners of “posh” marinas and are thought of as far higher maintenance than owners of boats used for recreational cruising. The Canal & River Trust inherited the problem of non compliant long term moorers. They have been far more proactive than British Waterways. When they took over from British Waterways the Trust gave existing non compliant continuous cruisers a little latitude but were far more strict with new live aboard boat owners. We’ve recently started contacting all newly registered continuous cruisers welcoming them to the waterways and providing them with information about the requirements they need to fulfill, and the action we’ll take if they don’t. I’ve attached the related press release, which I think you’ll find helpful. We want people to be aware of the cruising requirements so they don’t run into trouble later on. The Trust is working to raise awareness of these constraints amongst home-seekers and boat sales advertisers. It is also aiming to provide clearer information to the floating community so, from January 2014, will be contacting everyone newly registering as a continuous cruiser to ensure they fully understand the requirements. After three months, if there is concern about a boat’s limited movement, the charity will send a reminder and invitation to contact the local enforcement officer to discuss the cruising pattern. Ultimately if they can’t meet the movement requirements they will need to get a home mooring before their license can be renewed. The press release was written eighteen months ago but the Trust’s attitude towards boat owners who don’t comply with the rules hasn’t changed. If anything, the Trust is now more determined than ever to identify and challenge non complaint continuous cruisers. So now you know where you stand. You know that if you are considering moving onto a boat to live and if you need to stay in the same spot for work, healthcare or school, you need to find an official residential mooring if you want to avoid unpleasant visits by the Trust’s enforcement team, possible legal action of the possibility of having your boat removed from the water for non compliance. You know that in these circumstances you need to find a mooring so you need to know where to find them. You can start on this site. I have created a fairly comprehensive listing on of all of the inland waterways marinas on the network. You can search the marinas in two ways. Firstly, you can view where the marinas are located on this map. Click on the marina place marker to show brief marina details then follow the link to read the full listing. Alternatively, you can view an A-Z listing of the marinas here. The listing won’t give you all of the information you need I’m afraid. Many marinas which don’t advertise that they allow residential moorings will actually have boat owners living aboard unofficially. If you find a marina at a location which suits you, you need to pay the marina a visit, look for signs that there are live aboards are there and ask the boat owners what arrangement they have with the marina owners. Most live aboard boats are easy to spot. They will have the usual paraphernalia on or near the boat; roof storage boxes, planters, wheelbarrows, bikes and supplies of coal or logs. Moving away from this site but staying online, Apolloduck’s Marinas and moorings section is worth investigating. You’ll have to wade through adverts for coastal marinas and moorings too but the site is worth a look. The British Waterways Marinas Ltd web site is also worth searching. They manage nineteen marinas. Twelve of them offer residential moorings. CART manage many online moorings. Most are classed as leisure moorings but when I spoke to Sally Ash a year ago she told me that the Trust would rather see a leisure mooring with a residential boater on it than leave it empty. I asked Fran Read to confirm that the Trust are still happy to allow residential boaters to use these moorings. I haven’t received confirmation from her so you would need to do some investigation before committing to one of these moorings. The current listing is here. Offline, the classified adverts in the popular boating magazines and newspapers are also a source of available moorings. Last but not least, you should visit the area where you want to moor. Walk along the towpath and look for signs of residential moorings. They will usually be on the opposite side of the canal from the towpath. If you’re lucky you’ll see the mooring owner’s or agent’s phone number displayed. More often you won’t so you’ll need to ask one of the moorers already there. If a mooring isn’t available at that particular location, the person you’re talking to may know of available moorings nearby. Finding a mooring where you can officially live on board is going to take some time and effort but it’s a neccessary investment if you want to enjoy a tranquil and stress free life on board without worrying about unwanted visits by the Trust’s enforcement officers. Good luck with your search. The different between residential and leisure moorings – The interpretation of the moorings use is usually subject to the owner’s interpretation but this short article will give you a head start. Residential moorings and single handed boating – One of several forum threads on the subject of residential moorings. Do you need a residential mooring to stay on your boat? – Another short article on the subject. Daily Mail article about a live aboard family on the Avon – This was a fascinating article published by a national newspaper about the huge saving a family made by moving from a house to a boat. The article didn’t mention mooring fees, residential or otherwise, and initiated many comments on the forum. The cost of living afloat – If you read the Daily Mail article above you could be forgiven for thinking that living on a boat full time is a low cost alternative to living in a bricks and mortar home. You would be wrong. The costs are often far higher than many potential narrowboat owners think. I’ve put together a package which, I am often told, is the most comprehensive and easy to understand breakdown of the costs of buying and maintaining a narrowboat available anywhere. Types of mooring – Five questions from a wannabe residential boater answered. The forum is a wonderful resource for you if you are new to the concept of boating on the inland waterways of England and Wales. There are dozens of experienced boat owners waiting to answer your questions if you can’t find the information you’re looking for either on the forum or on the main part of the site. 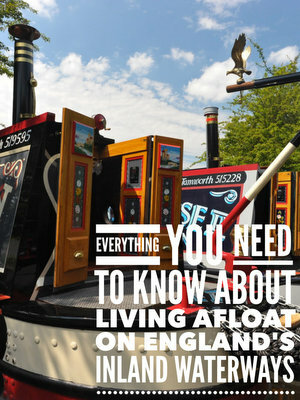 I receive emails every day asking me questions about living afloat. If the questions asked are of general interest, I always suggest that the enquirer asks the questions on the forum rather than me answer them personally in an email. I do this for two reasons; If the question is of general interest then the answer will be more useful on the forum than squirrelled away in someone’s inbox, and the question will get more comprehensive answers if asked on the forum and answered by more than one boater. Two or more heads are better than one. Quite often I will write what I think is a comprehensive answer to a poster’s question and then another boater will also reply and add points which I had either forgotten to add or which I wasn’t aware of. The forum is a wonderful resource but many new visitors to the site appear to be either too nervous or unwilling to post there. The forum is a friendly place frequented by friendly and very helpful boaters. I oversee the site content by reading every post which is made there. I read new posts as soon as I can to ensure that no offensive or unwanted posts dilute the excellent content. I moderate all new forum posts but, apart from a handful of spam posts each day which need deleting, I very rarely have to interfere because virtually 100% of posters are genuine boating enthusiasts who either want to learn or share knowledge about the lifestyle. If you want to find out the answer to an aspect of boating which puzzles you, don’t be shy. Publish your first post today. Posting on the forum us quite a simple process but if you get stuck with any part of the registration or posting process, just let me know.